When you're writing your music, settling first on a form and then trying to come up with a theme to fit it has things backwards. 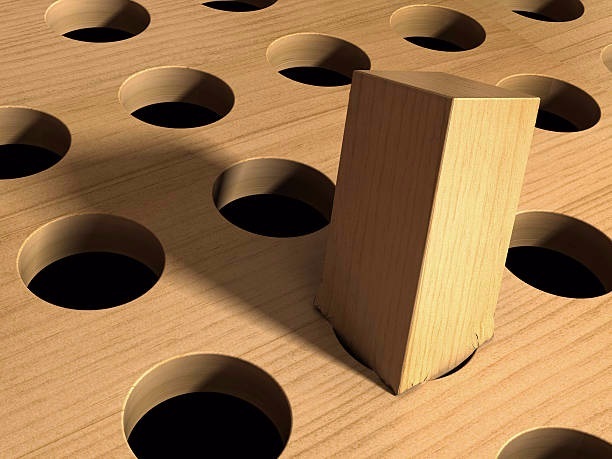 It's like trying to get a square peg to fit a found hole (photo). The theme will determine the form you should select that will bring out the best in it, not the other way around [See blog, Maze, Stuck]. Which is why, for example, not every theme is suited for fugal procedure ... or why a certain theme, because of its shape and note values, will make a better fugue than anything else ... or why a certain theme will make a better fugue for 2 voices, such as violin and flute, than for an organ fugue in 4 voices. This does not preclude however the study of various generic forms [such as binary form (AB), rounded binary form (AABB), ternary (ABA) form, song (AABA) form, fugal procedure, Sonata-Allegro (1st movement) form, rondo forms (ABACA, ABACADA, ABACABA), theme and variations, continuous expansion form, Vierne's 6-part form for working a free theme, etc.] which can be applied to an appropriate theme when the occasion presents itself.